I love watching old black and white films. Apart from the generally gorgeous aesthetic, I love the dialogue. The wit, the timing, the facial expressions. Two words come to me when thinking about these films: bold and elegant. I feel the same way about black and white photographs. There's something about them that draws me in. I think I will be doing more black and white food photography. I like how graphic is is and how it really suits simple styling. It's classic. The bright orange of this tart seemed almost garish. I wanted to decorate the tart with edible nasturtium flowers but the luminous red kept blowing out. The whole set up was too vivid. Sensory overload. I'm not in any way denouncing colour - I love vibrancy. Some things just don't work in black and white. Despite that, I like taking a step back and desaturating. I find it refreshing somehow. The two words I mentioned above are dear to my heart. Bold and elegant are two words I want to live by. I like life to be elegant, to have a certain refinement and beauty. I'm not ashamed to say I like beautiful things - art, words, colours, fabrics, food, smiles. Elegance is also being kind and generous. Trying to not gossip or judge. Respecting others but also - most importantly - yourself. To be shy is easy for me. To go about life being bold about my dreams, being bold about who I am - that is difficult. Yet, when I do push myself to be bold, it is always totally worth it. It's going and getting what you want. Yet I don't think being bold is arrogant or pushy. To me it is understand yourself and be true to that person. To be sure of who you are without pushing it into another person's face. To have courage to be strong in your beliefs, your morals, your ideas. To be comfortable in your own skin and your own choices. Bold and elegant. That's my life motto as I go into this new stage of my life. I may not succeed at all times. But that's who I want to be. I hadn't expected to adore this tart quite as much as I do. I keep sneaking slithers from the fridge. The amount of sugar is just right - you get a properly sharp hit of lemon but your mouth doesn't ache afterwards. Finally I am incredibly honoured to have been included in Fiona Beckett's 'Latest Food & Wine Blog Finds' post. Fiona is a very successful UK food writer who has written for pretty much every magazine and newspaper here as well as authoring 22 books. She gave a very inspirational talk at Food Blogger Connect and I'm overwhelmed that she called my blog "beautiful" and "well-written". Cut the butter up into small cubes and place back in the fridge. Sift the flour and salt into a big bowl. 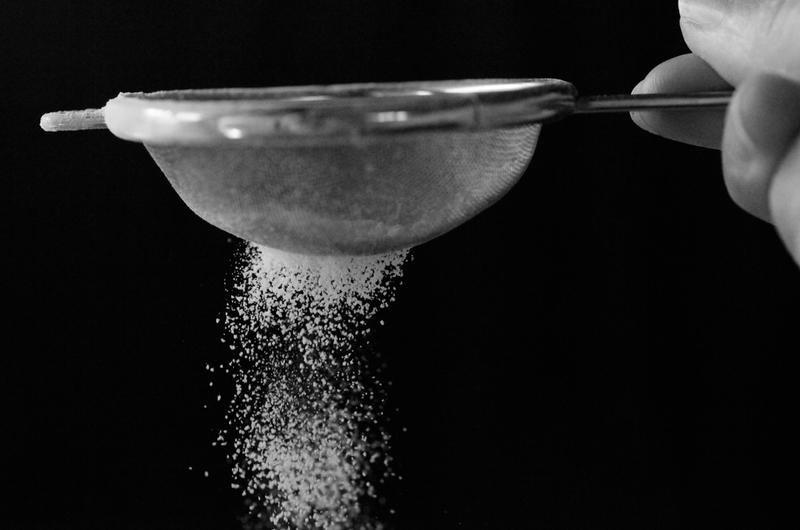 Weigh the icing sugar out into a small bowl. Separate one of the eggs and put the white to one side. Beat the other egg and egg yolk together in another small bowl and place in the fridge. Take the butter out and rub it into the flour until it resembles fine breadcrumbs. Sift the icing sugar over the crumbs and stir in with a blunt knife. Add the beaten eggs and knife through the mixture. Flour the work surface and tip out. Bring together with your hands and knead very briefly. Press into a circular disc about 3 cm thick. Wrap with cling film and refrigerate for 1-2 hours, or until firm. Butter a tart tin (22cm diameter and 2.5cm tall) then dust with flour. Tap to remove any excess. 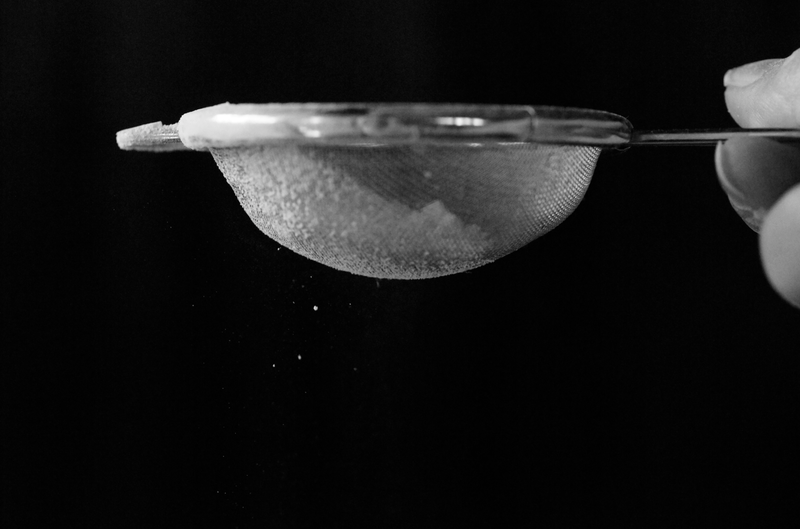 Dust the surface again with flour. Roll out into a circle of 28cm diameter. Fold over the rolling pin and transfer to the tin. Press into the edges, leaving a 1 cm overhang. Patch up any mistakes with extra bits of pastry (and keep any extra bits in case cracks appear during blind baking). Scrunch up a piece of greaseproof paper and line the tin. Fill with baking beans or dried beans - like red kidney beans. Place into the fridge for 15 minutes. Preheat the oven to 180C/350F. 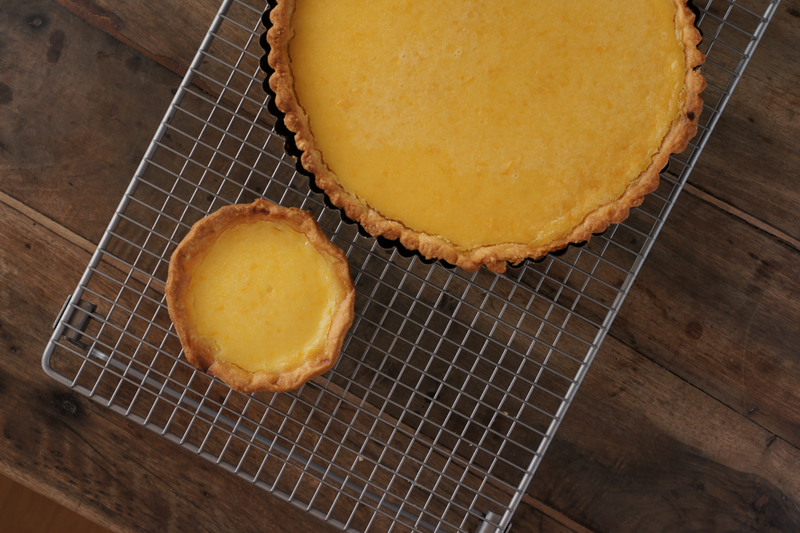 Place the chilled tart tin into the oven and bake for 20 minutes. Mix the egg white with 1 tbsp water. Take the tart out of the oven and remove the beans and paper. Plug any holes with leftover scraps of pastry. Brush the inside with the egg white. Place back in the oven for 5 minutes or until the pastry looks fully cooked and golden. Leave to cool on a wire rack. Lower the oven to 150C/300F. Zest the lemons - you should have about 1 tbsp zest. Chop the zest finely so you don't get stringy bits in the filling. Juice the lemons - you should have about 175ml juice. Whisk the eggs and egg yolk together in a bowl with the sugar until the sugar has dissolved and the mixture is smooth. Whip the cream until it holds soft peaks and then stir into the egg mixture. Stir in the rind and juice. Place the tart case into the oven, then pour the filling into the case (this helps stop sloshing as you put it into the oven). Start checking at 40 minutes - the tart should be set but still wobbly in the middle. It could take up to 60 minutes. Remove from the oven and leave to chill in the case on a wire rack. Once cold, remove from the tart tin and dust with icing sugar. Cut with a sharp knife which has been run under hot water to get a clean edge. I love the black and white images - sometimes I think they convey far more of the sense of food than colour images. And Fiona was right - your blog is beautiful and well-written. This is a gorgeous post. london bakes - Thank you, I'm so glad you like it. I know what you mean by a better sense of the food - colour can be distracting. Also, this is a lovely post. Bold and elegant are things I strive to be, too! Lemon desserts are my all time favorite. 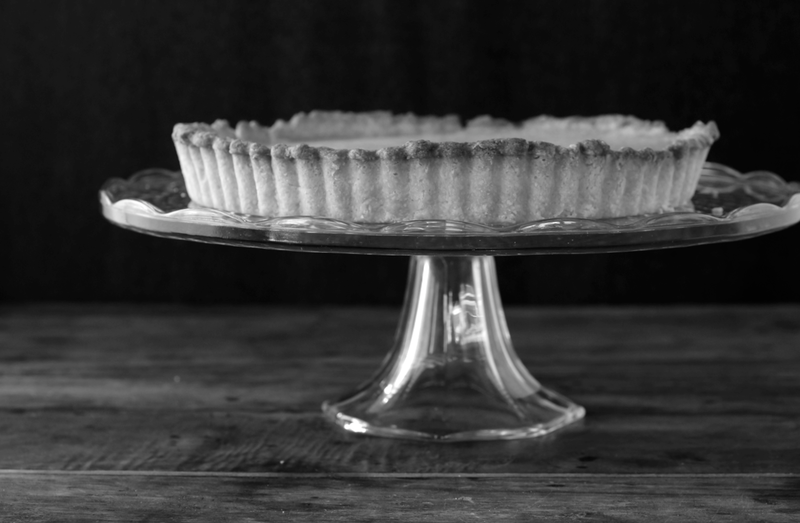 The tart is delightful and the black and white photos evoke a timeless magic to to your post. Bold and elegant, in both color and black and white. No matter the format, you manage to capture us with your words and imagery. Congratulations on the feature! Congratulations on being "discovered"! I thoroughly agree with Fiona Beckett. I love the black and white photographs (my absolute first love in photography!) 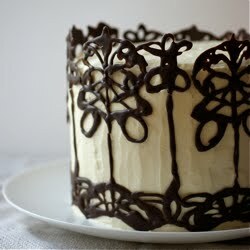 and have been looking for a while to find successful ways to meld food photography and black&white together. These are lovely. Lovely post Emma! I very much agree with everything in this post. Bold and elegant- what a fine life motto! 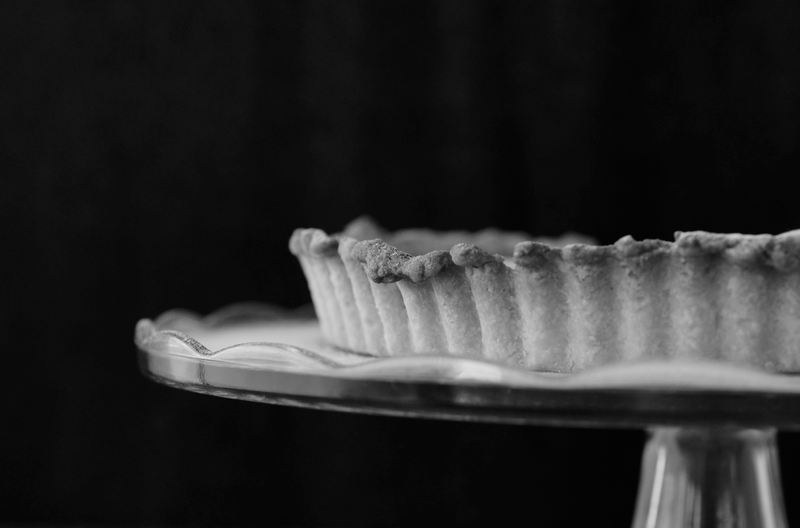 I've been dabbling with black and white food photography too, and really beginning to appreciate it. Lovely photos. Congrats on the mention from Fiona! Your tart does look delicious. You live in 2 of my favorite spots...England and Switzerland. We went to Swit. last year and it just took my breath away. I still day dream about the views and lushness. England will always bring to mind scones and clotted cream with jam as that was the first time we ever heard of it! Your tart is beautiful! your post is such an inspiration, i read it and just made everything in life seem simple and beautiful, that any goals can be achieved if you truly believe in yourself and are passionate..I will remember your words. I love seeing such a simple set of ingredients made into something so beautiful. I've been wanting a proper pastry pan for a while and this is the perfect excuse to finally get one. Thanks! Just gorgeous. 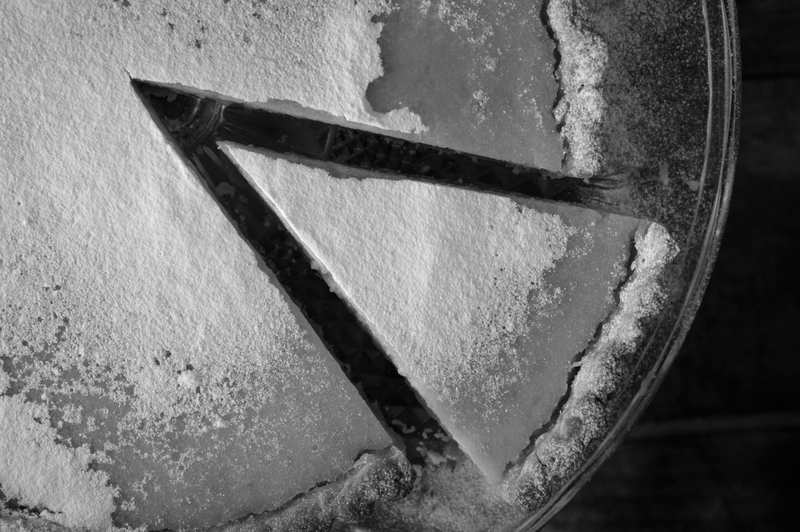 Those black and white shots of the icing sugar are so captivating and that tart sounds perfect. I'm a bit addicted to the GBBO too (loved last week's bread episode!) and got huge cravings for lemon tart after watching. Yours looks lovely, and your beautiful black and white photos do it great justice. The black and white works beautifully and kudos for the action shots with the seive. Well deserved mention by Fiona (one of the better speakers). Glued to GBBO and especially entertained by Mel and Sue's comments about soggy-bottoms. Love lemon tart myself but copied down my M-in-Laws recipe incorrectly and made it with 65g sugar (instead of 165g). I like it tart but...! Your reminder to be brave is good timing for me, taking a deep breath now. Kaitlin - they're great words, aren't they. Think I might write/print them out prettily and frame them for my new home. 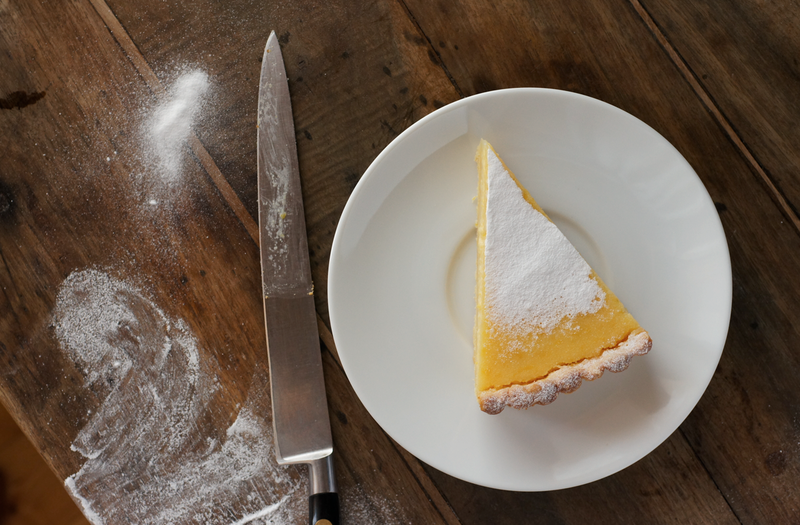 Deb - Lemon is definitely a classic dessert flavour - you can't go wrong. I like the idea of timeless magic, thank you. Emiko - I'm not surprised black and white was your first love in photography, it's so addictive and striking - and you can somehow see it in your photographs. It's funny how food sometimes suits it and sometimes doesn't - I've been surprised a few times recently. Bethany - glad you like it. Just thought - I've taken Jaden's life motto advice from the friday talk without realising! autumn - I hope you enjoy your new pastry pan! I'll take any excuse to buy some new baking kit. thelittleloaf - I loved the bread too - especially the focaccia bit as I've made that before. I really really wanted to make a basket too! Congratulations on the shout-out! You do indeed have a lovely blog. I am really enjoying your thoughts on food photography. I just made a lemon-raspberry tart with tons of zest--that sharp, super-lemony flavor really is the best. As for cooking the filling; I'm never sure with these curd-custard-egg based tarts; so tricky to get it right! Your tart looks fantastic. I love anything lemon. 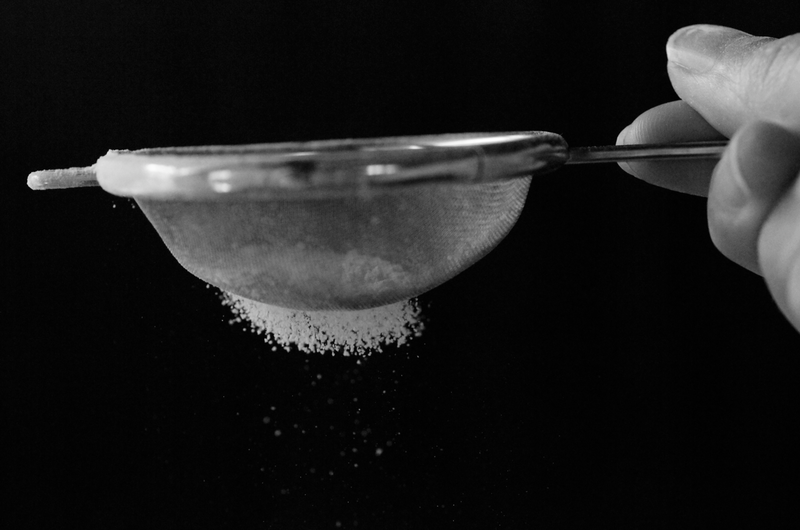 I especially love the black and white photos of the icing sugar being sifted. So beautiful. Congratulations on the well deserved mention by food and wine finds. Your work is beautiful and deserves recognition. Sara - Lemon-raspberry sounds delicious! Were the raspberries whole or part of the filling? Jennifer - thanks :) Lemon is such a versatile flavour. I will chime in and sing your praises too! This is one of my favourite desserts, and I'm becoming accustomed to referring to your blog for excellent, well written recipes. Thank you also on your beautiful words, they have come a time so perfect for me.. and I think you have made us all feel no longer alone in our own worries and doubts but give us strength to keep going and striving for the things we believe in and love. I just made this tart to Mary Berry's recipe too! I was surprised that it didn't call for being chilled for much longer as mine was very badly behaved! I also thought the recipe produced too much pastry and too much filling, If I made it again I would reduce it by probably a third. Despite whatever mistakes you made, yours looks about a zillion times more professional than mine! But the important thing is the taste and I agree it was delicious! wonderful put up, very informative. I ponder why the opposite specialists of this sector don't understand this. You must proceed your writing. I am sure, you have a great readers' base already!